Calvin, is a very sweet, loveable black lab, arrived on Friday for the weekend. He’s been coming to Robin’s Nest for a few years now and he is always super excited to get here. First he greets all his friends and makes friends with the new dogs that are here. Then off to search for all the tennis balls in the yard. 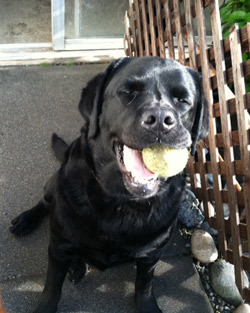 Calvin likes to have at least two or three balls in his mouth all the time. So Calvin gets the balls and we play fetch for a while. When it’s time to stop playing ball we have to take them from his mouth and we put them in the freezer. If we don’t put them in the freezer, he will continue dropping the slimy balls in our laps until we give in and throw them again. After some time has gone by, Calvin gets the fetch it and goes around the yard and gathers two to three more balls and we start the whole process over marketing again by the end of the day my freezer is packed with all the balls Calvin has gathered throughout the day. Robin has always loved animals and has had her own pet sitting business since 2004. Robin loves taking care of animals and loves to see happy dogs having fun. Robin’s Nest Pet Care will be around for a very long time.